The eZNS-T100 network sensor offers building occupants an intuitive touch-interface to adjust individual comfort levels while tailoring to the needs of their specific market. Along with a temperature sensor with humidity, CO2 and motion options, the eZNS also offers a choice of backlit colors to provide additional user feedback and esthetic appeal. The eZNS sensor’s NFC technology allows installers to use NFC-enabled mobile devices to configure the eZNS and enable enteliWEB integration. USB Service port, software enabled or disabled. Service tool not required. 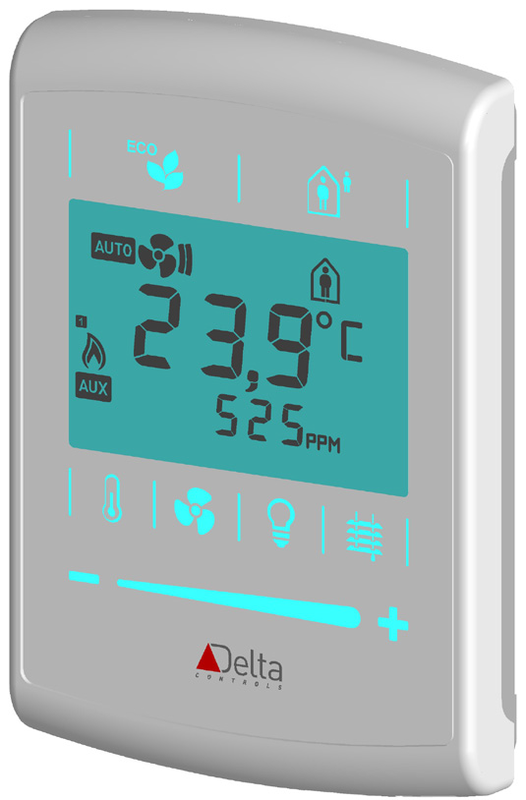 The eZNS is suitable for a wide range of sensing applications, from basic temperature monitoring, to indoor air quality and occupancy sensing. A customizable interface allows for intuitive user interaction. An available external input allows for additional zone monitoring such as window or door contact, temperature averaging or other dry contact sensor information. When paired with an application controller, the eZNS supports advanced control strategies such as demand control ventilation, energy savings based on occupancy and optimal user comfort. New customer training class – enteliWEB! We’ve had many requests for this, and are pleased to announce a new training class–enteliWEB! In case you haven’t heard about it, enteliWEB is web-based software which combines the power of enterprise dashboards with easy to use facility management tools. 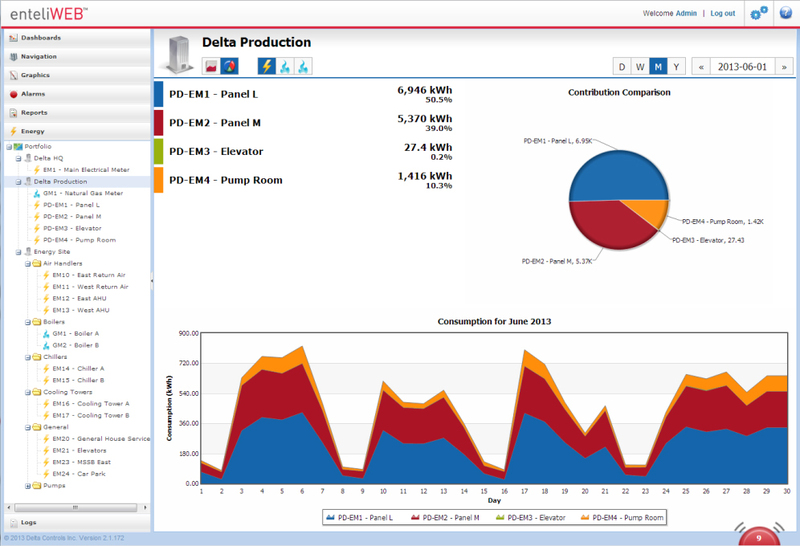 Customizable energy management dashboards and powerful energy reports give managers the tools to reduce consumption and lower costs. Visualizing both energy management and facility management on a single dashboard makes it easy to close the loop between monitoring and control. Whether you already have enteliWEB or are considering deploying it at your facility, this class will give you knowledge you need to better monitor and control energy use. The class will be held in our Colorado office on April 3 and 4, 2014. Click here to sign up! This entry was posted in Delta Controls, Training Department and tagged Delta Controls, energy management, enteliWEB, Facility management, Free Training on January 30, 2014 by John Becker. Analog Totalizers are used to calculate the accumulated quantity of a measured variable according to that measured variable’s rate. 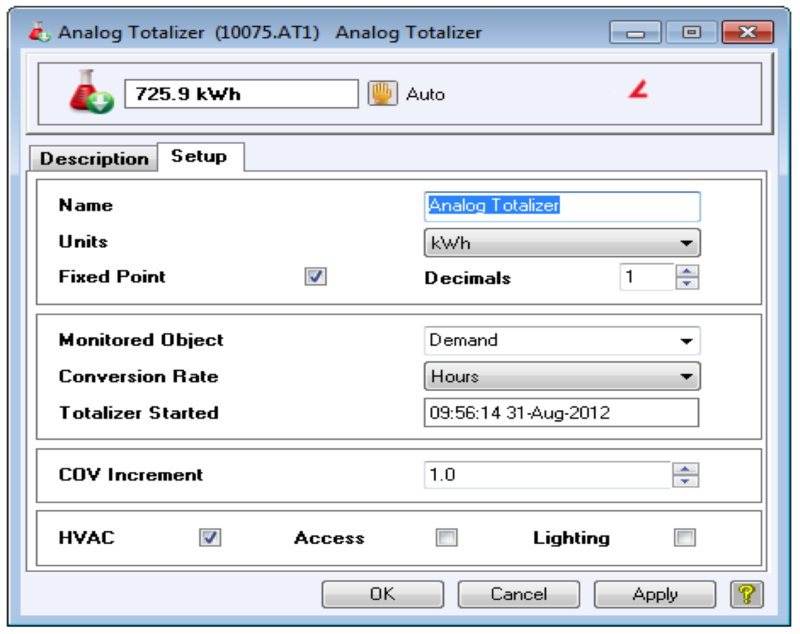 For example, by using an Analog Totalizer you could determine how many kWh of electrical consumption you have if you’re measuring electrical demand in kW. To do this you would simply enter the Monitored Object, select Hours as your conversion rate and kWh as your units. This entry was posted in ORCAview Tips and tagged Delta Controls, orca view tips, Setpoint Systems Corporation, solutions on January 21, 2014 by setpointsystems. In a recent post, we introduced boolean logic and the AND, OR, and NOT operators. Now we will show some common ways in which these can be accidentally misused in a GCL+ program, and how to correct these errors. As we saw previously, the AND operator compares two boolean (true or false) statements. If and only if BOTH statements are true, the entire statement will be true. This is very commonly used in GCL+ programs. There are some important things to watch out for, however! This entry was posted in Delta Controls, ORCAview Tips, Training Department and tagged Delta Controls, GCL+ programming tips on December 6, 2013 by John Becker. Since 1983, Setpoint Systems Corporation, an independent integrator of building control systems has been uniquely positioned to offer fully integrated system solutions on a common communications network. Their diverse and dynamic portfolio includes: 40+ story high-rise commercial office buildings, 1000+ room hotels, university campuses, K-12 school districts, hospitals, 40-megawatt data centers, top-secret military facilities, jails and prisons, and major league sports stadiums. CopperTree Analytics’ approach was driven out of frustration with “smart” buildings not delivering on the promise of intelligent and efficient operation. From its inception, the team at CopperTree knew there must be better ways to operate buildings, and they made it their mission to make buildings easier to monitor, diagnose, improve, and manage. For more than 30 years, Coppertree’s parent companies – Delta Controls (one of the largest independent building controls manufacturers) and ESC (Western Canada’s largest building systems integrator) – have been at the forefront of creating SMART buildings. Long before ‘sustainable’ was a buzz word, the founders were involved in energy audits and consulting; and so it was a natural extension to create Coppertree in response to the growing demand for building energy management services. Our heritage means we combine an implicit understanding of the technology, which controls buildings with the practicalities of maintaining them – so you get a solution, which delivers genuine energy savings. Know your energy issues – Fix what is broken. Put simply, Coppertree analytics provides energy management and fault detection diagnostics as software-as-a-service, which delivers you the power to optimize your building performance. We were frustrated how SMART buildings aren’t delivering on the promise ‘intelligent’ buildings inspired and we know we can fix that. Our mission is to lessen the climate changing impact of buildings by making them easier to monitor and manage. Based outside Vancouver, a city with a booming tech sector, we share a similar profile being young and multicultural. Our average age is 33, and diverse cultural backgrounds from Vietnam and India to Ireland and Russia. Learn more at coppertreeanalytics.com. This entry was posted in Coppertree Analytics, Setpoint Systems News and tagged Building automation, Building management system, Business, coppertree, Delta Controls, Energy, facility management system, Systems integrator, Vancouver on November 25, 2013 by setpointsystems.